The index opened huge gap-up just below 7900 on the back of favourable state election results and then stayed in a narrow range with small profit booking saw the index dip to 7857 but ultimately closed at 7879.40, huge gain of 99.70 points. The broader market was also strong, with 936 advances to 599 declines. The series range for the time being still at 7700-8100. 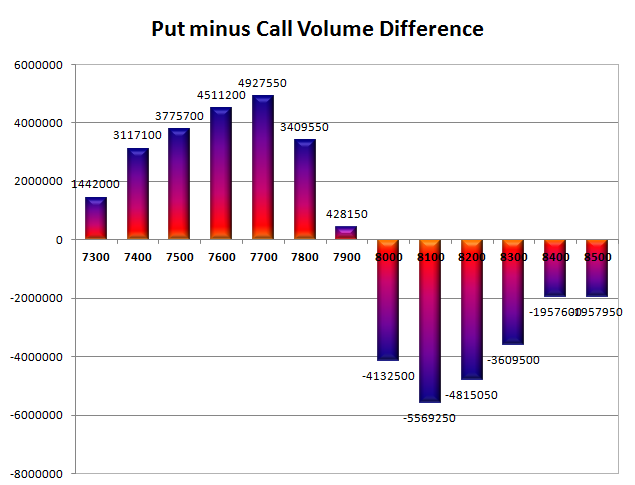 Call option did not add any OI with short covering seen at 7900 and below strike prices. Put option 7900 added huge 12.27 lacs OI with profit booking seen at 7800 and lower strike prices. 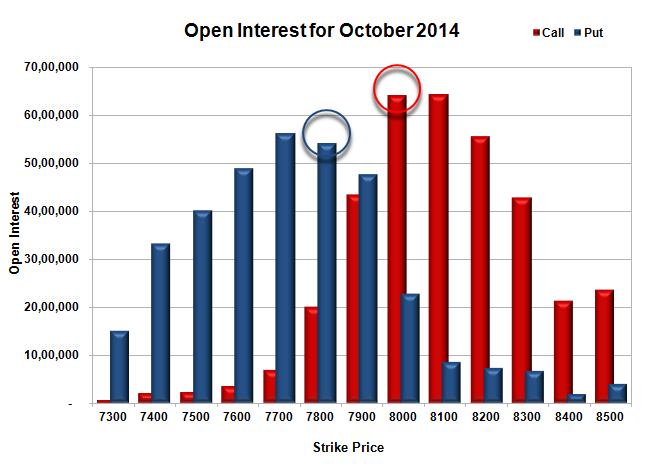 Nifty Open Interest is at 1,62,33,200 up by 5,86,300, with increase in price, probably huge long build-up. 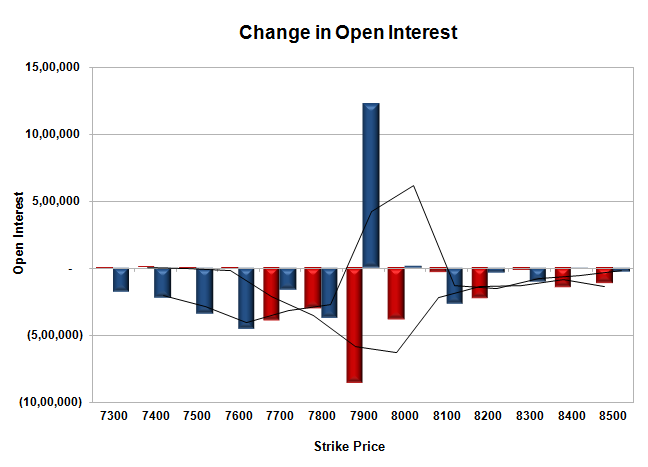 Bank Nifty Open Interest is at 18,28,700 up 72,025, with increase in price, probably huge long build-up. FII’s bought huge 18.26 lacs Futures, which includes 40477 contracts long build-up and 3915 contracts short build-up, with increase in net OI by 44392 contracts (includes 83922 longs to 47360 shorts for the day) and the average price per contract comes to around 7937.26. FII’s Index future open contract as on date is 221024 Longs to 77961 Shorts, net long 143063 up by 36562 contracts. Initial support at 7800, with huge OI of 54.25 lacs and below that at 7700 with huge OI of 56.19 lacs. Initial and very good resistance at 8000, with huge OI of 64.22 lacs and above that at 8100 with highest OI of 64.31 lacs. Day Range as per Option Table is 7802 - 7961 and as per VIX is 7821 - 7938 with 7881 as the Pivot.